And what might put Europe and the global financial system to the sword? Recrimination. It’s not my fault it’s everyone else’s fault. Now former ECB policy-maker and Euro-hawk Jurgen Stark has weighed in to tell Euro-hopping U.S. Treasury Secretary Geithner (in less direct language) to shut up and go home. Finger-pointing in the direction of Europe shouldn’t prevent others from putting their budgets in order and doing their homework before handing out advice to Europeans. Of course, Stark has a point. Europe is a complete mess, European policy makers are stumbling and slumbering forward to the gates of Hades. But America? The American economy is a jaundiced sham; where Europe has maintained a sliver of its former industrial might (i.e. supply chains, heavy & light industry, consumer manufacturing) in Germany, Scandinavia and the Netherlands, America prefers to ship a significant majority of its consumption (and even a lot of its infrastructure) from China (and subsidise the shipping costs through massive military deployment). 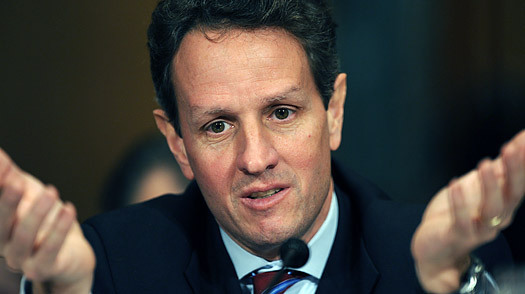 And what is it that Geithner is bringing to the table? • Treasury secretary Tim Geithner has been rebuffed by some EU financial ministers after calling for them to commit more money to fight the crisis. • Greece has been forced to wait until October for its next tranche of financial help. • Only 75% of Greece’s lenders are prepared to roll over their debts – or take a haircut. • Moody’s is refusing to comment on rumours that it might downgrade Italy’s credit rating imminently. So that’s Geithner’s solution? Throw more money at the problem? The reality is that these liquidity and solvency crises are symptomatic of underlying economic and social problems, some of which are common to both Europe and America. Banks on both continents have been bailed out, keeping profits they made in good times, and shoving the bill for the bad times onto taxpayers, creating moral hazard and an agency problem. Worse, these bailouts of banks — rather than just “saving the system” — have saved and sanctified the gambling, and other dangerous business practices that failed during the 2008 crisis. And the problems go far beyond the financial system — the technological, social and industrial changes to society of the last twenty five years have created huge amounts of unemployment, upheaval, alienation and massive compounding debt. And governments on both sides of the Atlantic have been very slow to respond. Simply “saving the system” — a system that is clearly failing — will do very little to address these upheavals. Perhaps governments believe that stabilising a fragmenting mess will give them the chance to then address the underlying conditions. It won’t. You can’t fit a square peg into a round hole. While the underlying conditions are fundamentally broken, the system will keep breaking until it is allowed to break. This entry was posted in Current Affairs, Economics for the Jilted Generation and tagged american hypocrisy, angela merkel, ben bernanke, bloomberg, efsf, eurobonds, eurobong, jurgen stark, parable of the broken window, paul krugman, the Guardian, tim geithner, zero hedge. Bookmark the permalink.